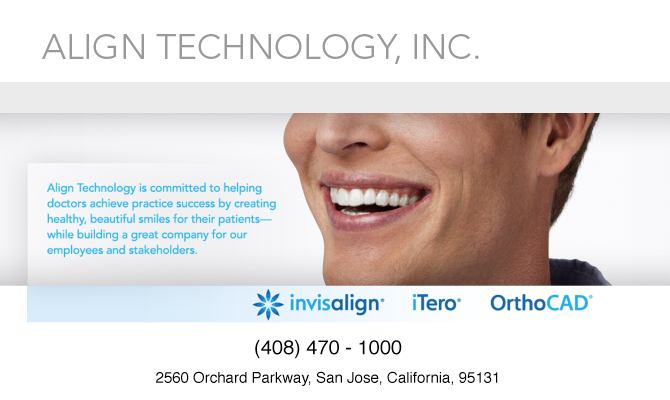 Align Technology is a global medical device company that pioneered the invisible orthodontics market with the introduction of the Invisalign system in 1999. Today, we develop innovative, technology-rich products such as Invisalign system of clear aligner treatments, the iTero scanner and OrthoCAD services to help dental professionals achieve the clinical results they expect and deliver effective, cutting-edge dental options to their patients. Since our inception, Align has always set the bar for leadership and change in our industry by constantly innovating to bring new and better solutions to doctors and their patients. Founded in 1997, Align received FDA clearance in 1998 and began its first commercial sales of Invisalign to U.S. orthodontists in 1999. In 2000, Align launched its first U.S. national consumer advertising campaign and a year later introduced Invisalign to the European market, launching the company’s first phase of international expansion. By late 2001, Align had manufactured one million unique clear aligners. In 2008, Align launched two new treatment options – Invisalign Teen® and Invisalign Assist® – with features to help doctors treat teen patients and streamline treatment planning and case monitoring support for Invisalign doctors who want additional treatment support. In 2011, Align acquired Cadent Holdings, Inc., a leading provider of 3D digital scanning solutions for orthodontics and dentistry, and makers of the iTero™ and iOC™ scanning systems and OrthoCAD digital services. The combination of Align’s and Cadent’s technologies and capabilities creates greater growth opportunities for Align by bringing innovative new Invisalign treatment tools to customers and by extending the value of intra-oral scanning in dental practices. Intra-oral scanning systems provide a dental “chair-side” platform for accessing valuable digital diagnosis and treatment tools, with potential for enhancing accuracy of records, treatment efficiency, and the overall patient experience. The use of digital technologies such as CAD/CAM for restorative dentistry or in-office restorations has been growing rapidly and intra-oral scanning is a critical part of enabling these new digital technologies and procedures in dental practices. In mid-2011, Align launched the Invisalign system in the People’s Republic of China –offering Invisalign Full, Invisalign Teen and Vivera Retainers directly to Invisalign-trained orthodontists. Align Technology is headquartered in San Jose, California with offices worldwide. The Invisalign system is offered in more than 45 countries and has been used to treat more than 1.5 million patients. The iTero and iOC scanning systems, available in over 20 countries, are open architecture systems which allow for compatibility with multiple laboratory-based CAD/CAM milling systems and 1,200 dental labs.